The following steps will set up an application in Xcode ready for enabling Gimbal features. Using Xcode 6.2 or higher. Important Right click the Project name and choose the Add files to ... option to add the framework. Note You will find this framework in the Frameworks folder inside the Gimbal SDK zip file. Please select the checkbox for Copy items if needed. The Linked Frameworks and Libraries in your General tab should now look like this. Verify also that the Gimbal Framework Target Membership checkbox is set. Gimbal SDK for iOS uses both Significant Location Change and Region Monitoring features of the iOS. In order to allow for this, multiple entries are required in the property list. In the Info.plist file located in the 'Supporting Files' folder, add new entries with keys 'NSLocationAlwaysAndWhenInUseUsageDescription', and 'NSLocationWhenInUseUsageDescription'. The values should contain a user visible string describing the app’s need for location permissions. Starting in iOS 10, Apple requires addition permissions for using Bluetooth peripherals, such as Gimbal Beacons. Similar to before, add a new entry to your Info.plist with a key of 'NSBluetoothPeripheralUsageDescription' and value as the descriptions as to why you are using Bluetooth peripherals. Starting in iOS 11, Apple will prompt users with the "Always" and "When In Use" location options. You can request only the "Always" location permission instead of "When In Use" on iOS 10 and below, which is managed by the "NSLocationAlwaysUsageDescription" property. Xcode allows you to mix swift and obj-c into the same project by using bridging header which exposes those files to Swift. Any public Objective-C headers imported here will be visible to Swift. In Xcode choose File > New > File... and from the left column, ensure iOS > Source is selected then choose Header File on the right column. Please ensure the appropriate target is set when creating the Header file. Objective-C Bridging Header - Path to Header file starting with the app name. 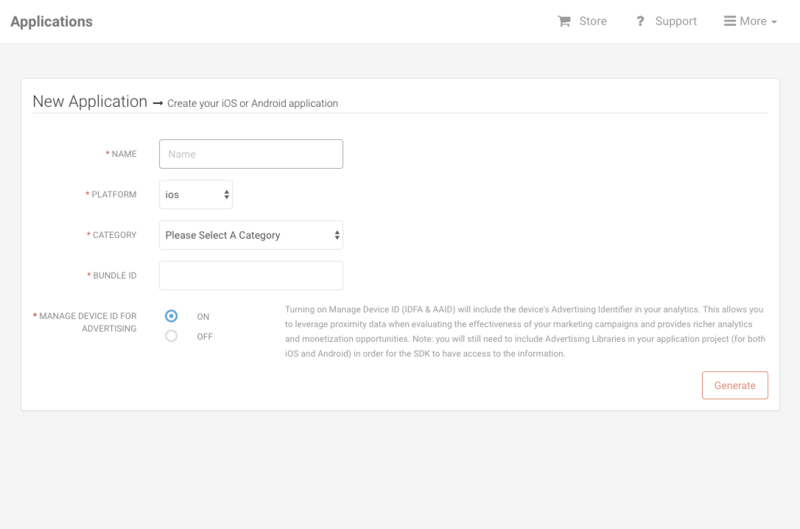 ie: "APP_NAME/NAME_OF_HEADER_FILE.h"
You will be presented with a form where you will enter the following information: Name of your app, Platform (ios), App category, and Bundle ID. Hit the 'Generate' button. 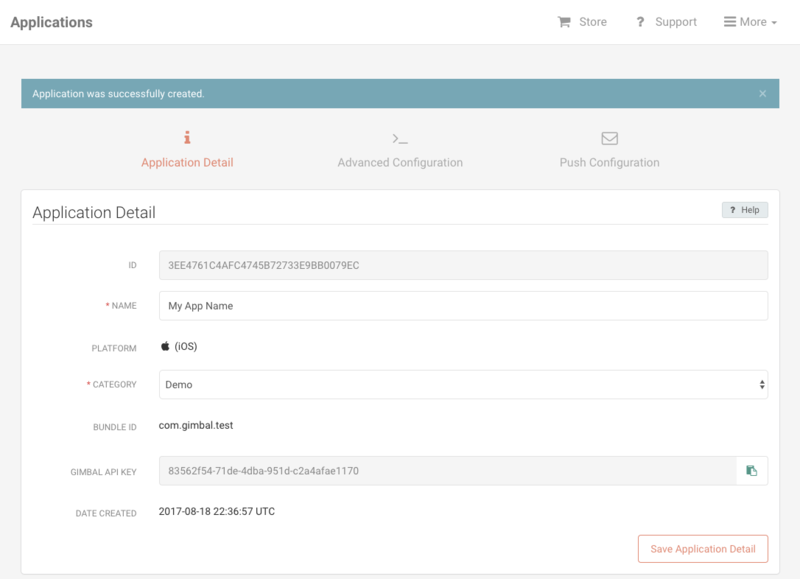 Once finished, your app will have a Gimbal API Key. setAPIKey also prompts the user for access to their location. By default the user will be prompted with the options "Always", "While in use" or "Never". You can manage this request on your own in the options parameter by setting the key MANAGE_PERMISSIONS with a value of false. You will then need to ask for location access on your own. The following creates a placeManager object and will trigger the callback to your delegate of place events. Thereafter, you will be notified of events for places your application is authorized for. Note Be sure to add the PlaceManager Delegate protocol to your class. This is the callback delegate for place events. 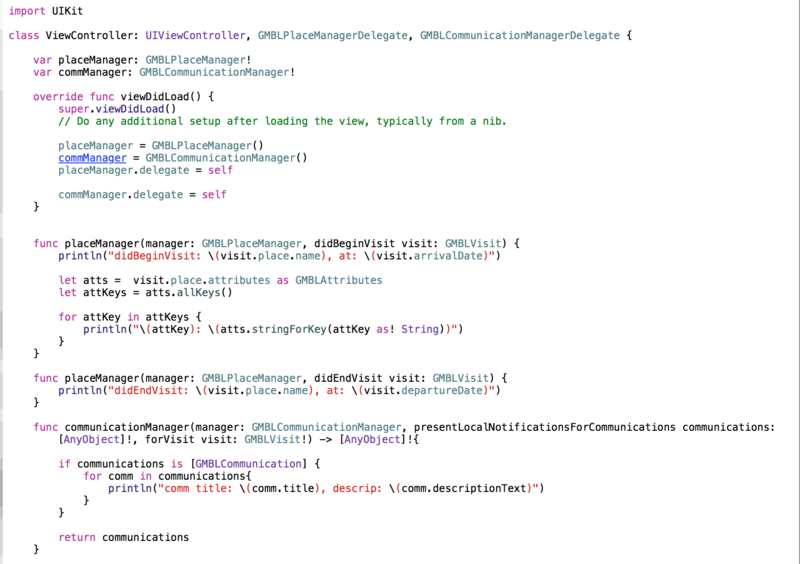 Note You must add the <GMBLPlaceManagerDelegate> protocol to your class. The following callbacks will be invoked when a place event occurs. The GMBLVisit class defines a visit to a place. It includes the place, the arrival date and the departure date to the place. If the visit is currently on-going, the departure date will be nil. 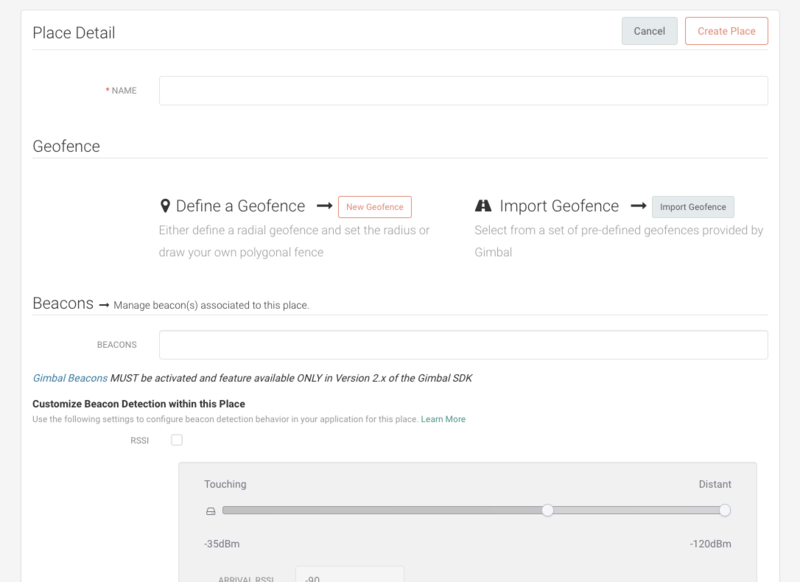 The GMBLPlace class defines a place which is represented by a geofence (circular or polygonal) or a series of beacons. A place is defined in the Gimbal Manager portal. The following creates a communicationManager object and will trigger the callback to your delegate of communications. Thereafter, you will be notified of communications for places your application is authorized for. Note Be sure to add the CommunicationManager Delegate protocol to your class. This call parses a GMBLCommunication from a UILocalNotification. 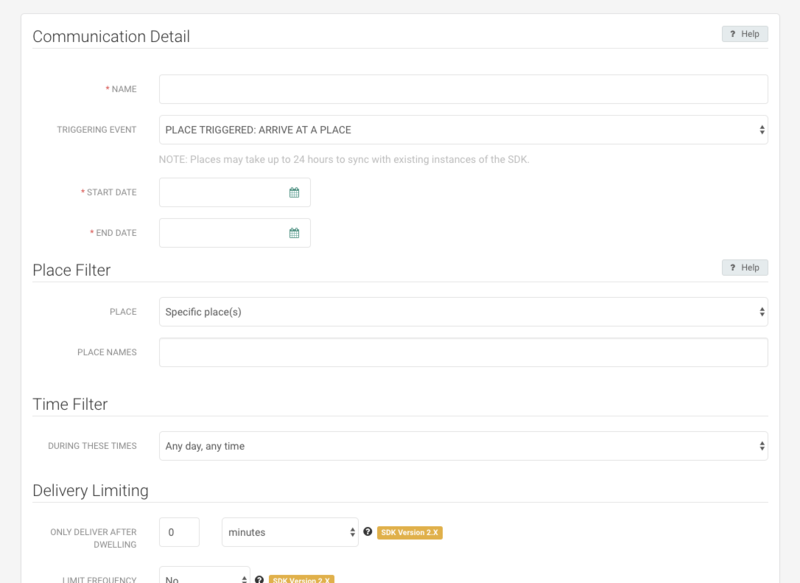 For example, when a Gimbal Place Event generates a UILocalNotification and the user clicks on it you can use this call to parse out the Gimbal Communication. This is the callback delegate for communication notifications. Note You must add the <GMBLCommunicationManagerDelegate> protocol to your class. The following callback will be invoked when a place communication event occurs. The callback provides the opportunity to filter which communications will be presented as local notifications. // This will be invoked when a user has a communication for the place that was entered or exited. // Return an array of communications you would like to have presented as local notifications. // Do not return any communications whose scheduling and delivery will be handled by your app. The GMBLCommunication class defines a communication that was defined on the Gimbal Manager Portal. To properly receive Gimbal Proximity events in the background your application needs to enable the following iOS background modes. In the foreground your application should be notified for most Gimbal Proximity Events that originate from a beacon. In the background this is not the case. In the background the device receives Bluetooth LE events much less frequently. The following table shows how long it takes to receive an Arrive event from our VisitManager based on the testing we've done on iOS devices.